Could the best value in smart plugs really come from a company named Etekcity? You bet. Providing more features than their big name competitors, this smart plug is half the price and still gives you voice control options with Amazon and Google. In an industry where flashy brand names dominate, it’s nice to come across those hidden gems. So when we noticed a rather unknown company named Etekcity sitting atop the electrical outlet switch category on Amazon, it came as a surprise. 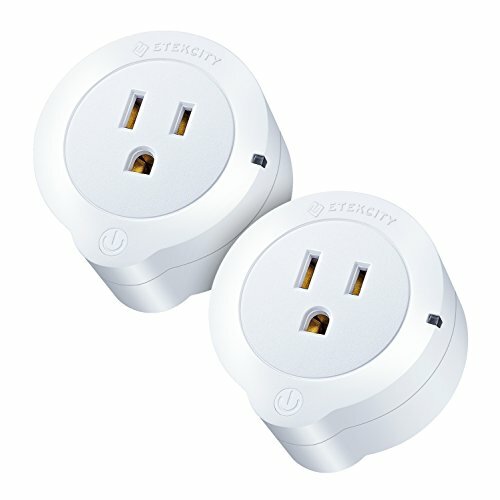 The Etekcity WiFi Smart Plug Mini (also called the Voltson Smart Wi-Fi Outlet) comes priced at just under $25 for a pair making it one of the most affordable smart plugs on the market. It claims a slew of smart features along with compatibility with Google Home and Amazon Alexa. 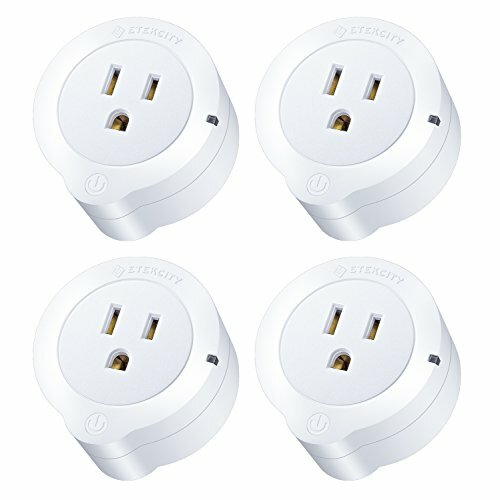 The question is could a budget smart plug really match up with it’s name brand competitors? One of the major issues with early smart plugs were their bulkiness. They tended to block both outlets and protrude a great deal from the wall (we’re looking at you TP-Link HS100). But that’s slowly evolved toward “mini” designs and the Etekcity plug is following in that path. The plug is round and measures 2-1/4″ in diameter. A bump at the bottom where a physical on/off button resides adds about a 1/4″ to it. That bump does cause it to block the outlet underneath it if it’s placed in the top outlet (or the left outlet). But if you’re using it on the bottom outlet, you should be fine to fit any normal sized plug into the other outlet. The same goes for power strips as you’ll want to use the plug on the last outlet available. Unfortunately, the design does preclude you from using two Etekcity plugs in the same set of outlets. The Belkin WeMo Mini Smart Plug handles this better by going wider in their design so that two can stack. Overall though, it’s not a bad design for a smart plug in this price tier. The light is not annoyingly bright. The on/off button functions as it should. And the whole unit has a much sturdier feel than what you find from the slew of budget options available. Being a WiFi enabled, the Etekcity (Voltson) doesn’t require a special hub or bridge to use. It doesn’t require an Amazon Echo or Google Home smart speaker.It connects directly to your current Wi-Fi setup (2.4GHz frequency only) and can be controlled via your smartphone. To get started, you’ll be instructed to download their app named VeSync which is available for both Android and iOS. This appears to be a 3rd party app that can handle some other smart home brands as well. The app does a good job of walking you through the connection process. The first option didn’t work for us so we had to use the APN setup. This involved holding a button on the device for 10 seconds, connecting our phone to the temporary WiFi access point, and then entering in our wireless credentials. This all seems more complicated than it really is. It should only take about 3 minutes per plug and the app does a terrific job of walking you through each step of the process. We don’t ask much out of our smart plugs but the Etekcity Wi-Fi Mini exceeded our expectations. Beyond the rather simple setup, the VeSync app is as straightforward and as easy to use as anything out there today. The on/off functionality had next to no lag and there was only been one dropped connection with one of the plugs in over a month of use. The added features and simplicity of using them is where this product really shines. Schedules are incredibly easy to setup. There is even a function where it automatically will work off your local time’s sunrise and sunset. A fun feature I haven’t seen on any other smart plug is countdown mode. Simply click the button on the app and input a time where you want them to shut off. Great if you want to tell the kids that it’s lights out in 10 minutes. Or use it as a sleep timer for a table fan or television set in your bedroom. Perhaps the biggest surprise was the inclusion of energy monitoring tools. Typically these come at an additional cost. The monitoring begins immediately within the app and was accurate. A log even tracks it over time if you’re trying to track down an energy hog. You can even set up alerts that will shut off the plug (or e-mail or text) if it reaches certain wattage levels. In the last year, Etekcity has added both Amazon Alexa and Google Home Assistant support. This means you can turn on and off your device using simple voice commands. There wasn’t any documentation on this in the package so we had to kind of wing it. You’ll want to add the VeSync skill on Amazon or find VeSync in the Google Home devices section. Connecting them required a couple attempts but did work. Unfortunately, that’s the only compatible services that are available at the moment. It’s unlikely you’ll ever see Apple HomeKit support with these. Samsung SmartThings seems a bit of a long shot too. But IFTTT and Stringify could be in the future and would add a lot of potential to these devices. With all the praise we’ve laid on the Etekcity Mini Smart Plugs, we did have a little caution for their safety. The company has responded to some Amazon reviews that the devices are UL certified. But no certification was listed on the box and we couldn’t find them within the UL certification directory (it could be under a parent company name). They claim to be able to handle up to 10 amps and we did test them right at that limit with a few devices. The plug didn’t get overly hot and prying open one of the plugs does show what appears to be a well built device. Etekcity has been selling electrical products for some time and we see no major issues in their history. Despite that, we would caution what you use them for. It’s definitely recommended to stay under the 10 amp threshold and perhaps stick to simpler devices like lights, fans, and coffee makers. If you’re looking to use them with air conditioners or space heaters, I’d stick with the TP-Link HS105 or WeMo Mini. Both are certified at up 15 amps. There are smartphone gadgets you want to spend money on and there are those you want the budget option. Smart plugs fall in the latter. For their limited uses, you don’t want to invest $30 for a single plug if you don’t have to. That’s why the Etekcity Mini is such a good buy where it’s priced. For less than half the price of their name brand competitors, you get the same performance and more features. You also have voice control through Amazon and Google. This is a no-brainer buy for anyone in need of a smart plug.